A fabulous pair of sandals for ladies who like a comfortable and lightweight every day shoe. The 3 way adjustable velcro straps allow for total on and off ease. The leather uppers are soft and the metallic floral embellishments on the straps add a lovely feminine touch. 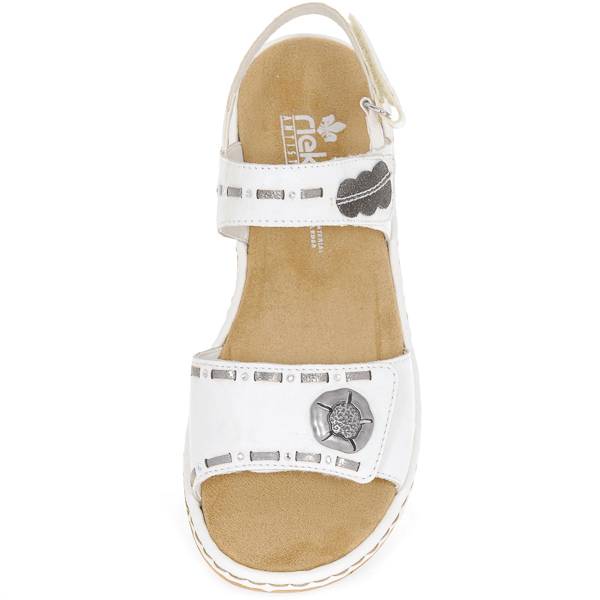 Rieker have used their popular anti-stress technology in the sole unit so along with the flexible and shock absorbent sole and padded insole, these sandals provide total comfort...perfect for every day wear. Average user rating 5/5 based on 2 ratings. Excellent service from The Shoe Horn. Very prompt delivery. Delighted with my Rieker Sandal, excellent fit and very very comfortable, which I was looking for. Would strongly recommend. Hassle free. Delighted with the look, comfort and quality of my new sandals.